Practicing law in Minnesota since 1968, Dennis Neeser is BV® Distinguished™Peer Review Rated by Martindale-Hubbell®. A 1965 graduate of the College of St. Thomas in St. Paul, MN, he graduated from the University of Minnesota Law School. Dennis began his career as special assistant to Minnesota attorney general Douglas Head, serving in that capacity for two years. From 1970 to 1980, he was assistant county attorney, prosecutor and advisor for Kandiyohi County. Dennis was also the principal partner of the Neeser Law Office from 1972 to 2000 and Of Counsel for Gray, Plant & Mooty from 2009 to 2012. Dennis is an adjunct instructor at Willmar Community College. Author of the Minnesota Peace Officers Training Manual, he has led extensive statewide training sessions in criminal procedure for peace officers. Dennis is licensed to practice in Minnesota and federal tax court. He is a member of the Minnesota State Bar Association. 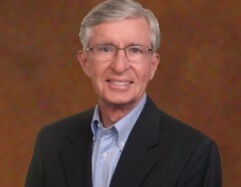 Active in the community, Dennis is pastpresident of the Willmar area Chamber of Commerce and has served on the boards of Willmar Community College, St. Mary’s Catholic Church and North American State Bank.